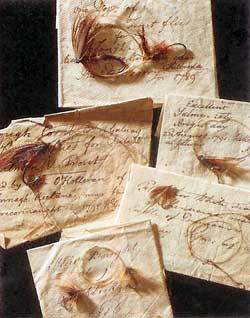 Snelled Irish wet flies from 1789, among the oldest-known surviving trout flies in the world, reveal the looser dubbing style that evidently prevailed among many fly tiers before the modern era. Photo courtesy of the American Museum of Fly Fishing. ONE DAY LAST SUMMER, I was fishing a small, undistinguished local trout stream, and as I released one of its small, undistinguished local trout, I noticed that the hackle on my Adams had unwound and was trailing loose. But when I reached for my fly box to replace the ruined fly, I found myself wondering: Did the fish I was releasing tear that hackle loose, or was the loose hackle the reason the fish took the fly? The trout wouldn’t tell me, of course, and rather than launch what I knew would be a quixotic attempt at empirical study by continuing to fish with the damaged fly, I put on a new one. But the experience got me thinking about one of angling folklore’s most intriguing and persistent minor narratives. Spend a little time out on the shadowy margins of fly-fishing propriety and you’re sure to encounter the tale of the ratty fly. A lot of fishermen remember a day when they were using a fly the fish loved so much that they gradually chewed it to pieces. And still the fish took it. There is a common implication in these stories — that the rough, half-wrecked fly actually caught fish better than a new, tidy one. This appeals to our sense of iconoclasm, of course, especially if we’re a little tired of being told we have to get this hackle or that dubbing just right. Now and then, it’s nice to think that trout will go for something a little less formal and bookishly precise. Still, the question remains why such accidental and short-lived fly “patterns” sometimes work so well. Flies don’t fall apart gracefully. They get lumpy, or start dragging loose pieces. The head unravels, or ribbing pulls free and sproings out to the side. The body and wings rotate embarrassingly around the hook shank or just scrunch down toward the bend of the hook. None of these developments would seem to help the fly catch more fish, but for some combination of reasons and conditions, some terribly contorted flies do keep working. Why? Of course there are plenty of casual explanations out there. It could just be an off day for the trout, who are in such a generous mood they’d take cigarette butts or dandelion seeds. Or maybe we should just see the success of the ratty fly as a modest corrective to keep us humble and realistic when we get a little too puffed up about our imitation theories. Besides, many of the very best fly patterns — the Hare’s Ear comes to mind right off — have always featured a somewhat unkempt overall appearance. The old Casual Dress and Muskrat patterns typify the same approach — keep it loose, keep it buggy, hope for the best. Our neglect of rattiness in our fly patterns is probably more important than we’ve realized. I have begun to think that to an unappreciated extent, the highly refined, tightly prescribed fly patterns we depend upon today are mostly a product of the past century or so, and that for long centuries before then, the average fly was a considerably less tidy thing. Our long-ago forefathers clearly didn’t feel the need for such thoroughly defined and tightly wrapped fly patterns as we now favor. By contrast with the precisely tied and undoubtedly beautiful Victorian wet flies and most fly patterns developed since then, the one thing that characterizes almost every one of the few flies I’ve seen that dates from before about 1830 is a consistent looseness of form — surprisingly coarse dubbing (which often provided the fly’s “legs” in its errant longer strands), raggedly mixed winging materials, and an overall scruffiness that suggests to me that those guys in the seventeenth and early eighteenth centuries may have operated out of a whole different aesthetic stance than the one we adhere to today. Most important, I imagine that those rougher traits of earlier flies were not the result of the craft of fly tying being in a more primitive state back then, so much as they were a recognition of what worked on the trout. Fernie was talking about relatively mild rattiness, of course. A certain indistinctness of outline in a fly pattern — as exemplified by, say, Polly Rosborough’s fuzzy nymphs, or John Atherton’s “impressionistic” dubbed dry-fly bodies— is nothing new in fly tying. But we’re not talking about mere blurry visual edges here. We’re talking about the apparently random and catastrophic disassembly of the fly itself, with chunks poking out in unplanned directions, and other chunks simply falling off. Other anglers have applied more thought to the matter, and the most comforting rationalizations we’ve come up with to explain the success of such flies involve emergers. The growing appreciation of emergers among anglers in recent decades— based on the realization that a variety of aquatic insects spend critical moments of their emergence looking neither like traditional nymphs nor like traditional dry flies — has generated a wealth of wonderful, if unorthodox, new fly patterns. As Gary Borger wrote in Nymphing (1979), emergers “are a ragtag, rumpled, and disheveled group. The very best imitations are themselves a disreputable-looking lot.” In defiance of traditional fly-tying conventions, these new creations sprout little tufts of feather or dubbing here and there, or drag an unorthodox appendage — feather, fur, yam, whatever — behind the body, to suggest a trailing nymphal shuck. I suspect there’s a lot more to the mystery than emergers can show us, but it’s a good start. Even a quick turn through Doug Swisher and Carl Richards’s Emergers (1991) should convince you that flies do indeed pass through a brief but significantly un- “classic” stage in their appearance as they shed their nymphal skins. Among those little insects who are at all other times in their short lives elegant and beautiful, emergence brings on an undeniable if momentary clumsiness and disproportion. Rattiness abounds. The ratty fly is good for us. It makes us think, and it keeps us off our high horse of overconfidence. It has made me rethink old ideas of my own several times. About thirty years ago, a friend of mine from Utah showed me a local dry-fly pattern known as the Hank-O-Hair. It consisted entirely of a few deer hairs laid unevenly along a hook shank and lashed tight to the shank in the middle so that the hairs splayed out in all directions. At the time, I was fully under the influence of the sport’s more cosmopolitan thinkers, and found the thing kind of offensive. I didn’t question that it would catch fish, especially where I lived in the Rockies, where I caught naive mountain trout on even less impressive “flies” than that. It just didn’t fit my idea of how to play the game. But many years later, as I became familiar with the finer points of surface tension and read the more recent fishing books on the feeding behavior of trout, that simple deer-hair pattern made more and more sense as an actual imitative fly. Specifically, the Hank-O-Hair’s widely radiating strands of deer hair would have done more than support the fly on the water. From the trout’s point of view, looking up at the mirrored undersurface of the stream, those widely splayed hairs probably gave a pretty good imitation of insect feet pressing into the surface film — the “starburst” pattern of light disturbance in the mirrored underside of the water’s surface described so well by Clarke and Goddard in The Trout and The Fly (1980). The wise Canadian angling writer Roderick Haig-Brown deserves the last word on the mysteries of rattiness. In Fisherman’s Spring (1951), Haig-Brown said that the experience of catching fish on such “tattered and torn” flies was universal among anglers, but he took the experience another step. I used to think that the explanation was probably in the immediate conditions, in the day and the way the fish were taking. But I have kept these battered flies sometimes and find that they still do well on another day, in another place, under quite different conditions. Maybe the lesson of the ratty fly isn’t well enough learned until we get in the habit of setting the fly aside at the end of its great day, and using it again.